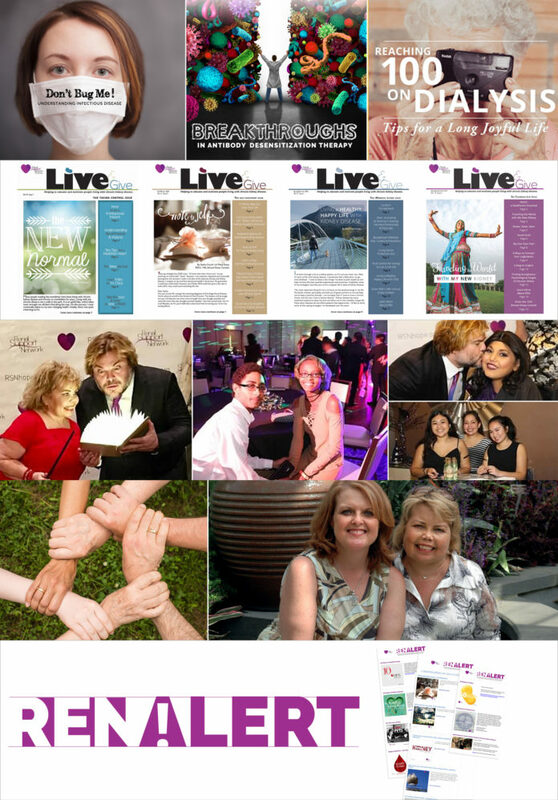 Home Health Library I Want More Dialysis…Please! Many of my current dialysis patients as well as others around the United States are asking for more dialysis. They want to feel better and “get their lives back.” Allowing them to perform their own dialysis in the home setting and receive more total hours of dialysis is empowering. Patients have shared with me and I have witnessed how much better their lives can be when they receive the optimal dialysis. So are you receiving optimal dialysis, or just adequate dialysis? So are you receiving optimal dialysis, or just adequate dialysis? This is a hot topic right now in the corporate kidney world, and should be among dialysis patients as well. 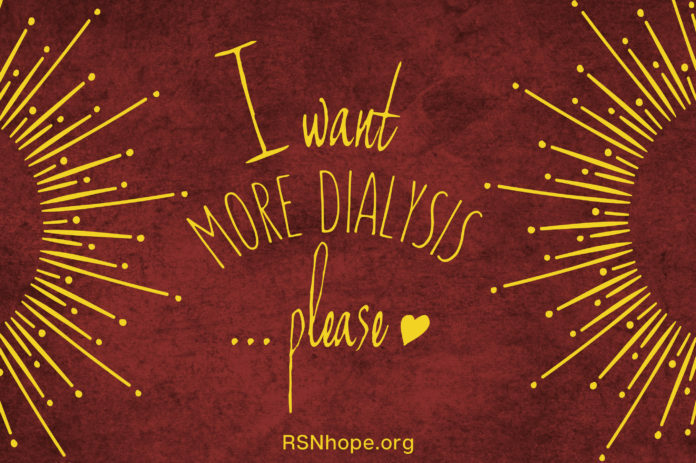 Dialysis patients in the United States who make a request for more dialysis receive any number of responses, spanning from lack of scientific evidence to inability to cover costs, all of which are inadequate responses. When requests are made to Congress for reimbursement for home modalities, the response is always: “What is the evidence that more dialysis is better?” How did we get into this situation? Given the current debates and pending legislation regarding therapies for chronic dialysis, it seems appropriate to take a moment to re-visit the history of dialysis to determine how we arrived at our current prescriptions. In 1964 twice weekly dialysis for 10-16 hours was considered the norm. It was not until 1960 when Dr. Belding H. Scribner developed the “Scribner shunt,” which allowed repeated access to the blood stream, that hemodialysis for chronic renal failure became a reality. The original dialysis schedule was hemodialysis, performed once every 5 to 7 days and lasting 20-24 hours. However, within several months, dialysis frequency was increased to 10-16 hours twice a week in order to reduce the development of uremic symptoms (tiredness, pruritis (itchiness), nausea, vomiting), nerve damage and symptoms, and to treat very high blood pressure. In 1964 twice weekly dialysis for 10-16 hours was considered the norm. The change to three times weekly dialysis evolved during 1964 and 1965. This was more convenient for the in-center schedule. The 12-16 hour schedule, twice a week, was difficult for the families and some of the patients still developed the same medical problems of nerve damage and inadequate blood pressure control. In addition, the University of Washington developed a home hemodialysis (HHD) program in 1964. The 12-16 hour schedule, twice a week, was difficult for the families and some of the patients still developed the same medical problems of nerve damage and inadequate blood pressure control. The dialysis schedules were changed to three times a week and moved to overnight, for 8-10 hours, which was easier for the families and the remaining symptoms resolved. This prescription was suggested by Dr. Stanley Shaldon (London, England) at a dialysis conference in Seattle in 1964. This overnight schedule resulted in an overall increase in patient stamina, better blood pressure control, decrease in nerve damage and liberalization of dietary restrictions as well as significant ability for patient rehabilitation. HHD had another advantage, it was more cost effective. Funding for dialysis was limited and not all patients received dialysis. In 1972 there were 11,000 patients on hemodialysis and 40% were doing Home Hemodialysis (HHD) rather than in-center. Decisions for this life sustaining therapy were made by committees. In 1967, the Board of Trustees of the Seattle Artificial Kidney Center (SAKC, which had been established by Drs. Scribner and Haviland in 1962) required that all patients accepted for maintenance hemodialysis must agree to HHD at the discretion of the medical staff. 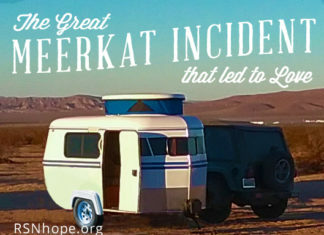 By 1972 SAKC had 90% of their 130 patients at home with the help of family, and most were nocturnal. In 1972 there were 11,000 patients on hemodialysis and 40% were doing HHD rather than in-center. The transition from the long thrice weekly schedule to the current schedule was probably a product of several factors. With the advent of the 1973 Medicare coverage of dialysis there was a proliferation of free standing dialysis units and for-profit dialysis companies. The population changed to include older patients and those with diabetes mellitus as well as other medical conditions. Dialysis times were reduced in order to accommodate three and sometimes four shifts of patients per day with a thrice weekly schedule. High flux/more efficient dialyzers became available and the result was to reduce dialysis time in order to treat more patients in shorter treatments. The patients preferred this also, since it optimized convenience though not necessarily health. In 1992 only 1.3% of the hemodialysis population was on HHD and by 2005 the USRDS (United States Renal Data System) reported 0.6% on HHD. Although the dialysis time in the US decreased significantly this was not the case in Tassin, France which had the most impressive program of “long dialysis” in the world. The program was started by Dr. Guy Laurent and continued by Dr. Bernard Charra, one of Dr. Scribner’s students, and has continued for over three decades. They prescribed 8 hours of dialysis three times per week, performed either at home or in-center. Their average mortality rates are less than 50% of the expected value in comparable patients in either the United States or elsewhere in France. The excellent survival rates are attributed to a lower cardiovascular mortality. They also report better control of phosphate, few patients on phosphate binders, an average dose of erythropoietin one-third that of the average in the United States, better nutrition and fewer blood pressure medications. The most common prescriptions have been either short daily hemodialysis or slow nocturnal hemodialysis. Given the clinical improvement in the patients when the frequency of dialysis was increased from 1 to 2 then 3 times per week, as well as the logic that more dialysis would more closely emulate the function of the human kidneys, a number of investigators in the United States and across the world have studied forms of daily dialysis. The most common prescriptions have been either short daily hemodialysis or slow nocturnal hemodialysis. Although daily regimens can be delivered in the setting of an outpatient dialysis facility they are much more conveniently delivered in the home setting. Results of patient studies on short daily regimens have demonstrated: an improvement in well being, appetite and energy, improved blood pressure control, reduction in blood pressure medications, an increase in albumin levels and in some cases better hematocrits with less erythropoietin required. Several groups have studied longer daily regimens (7-8 hours overnight) using slower blood flows or “slow nocturnal hemodialysis.” Again, the results showed an improvement in patient well being, the patients often returning to full time employment as well as improved cognitive testing, improvement in serum phosphate levels, reduction in the need for phosphate binders, general liberalization of the diet, better blood pressure control, few blood pressure medications, improvement in cardiac function, correction of sleep apnea, decrease in erythropoietin requirements with better hemoglobin and hematocrit levels, a reduction in hospitalizations and reduction in global health care related costs. Although, the numbers have not been adequate to show a statistically significant improvement in survival, the patient survival was reported at 81% at five years, far superior to the current USRDS statistics of an annual mortality of over 20%. Many of my current dialysis patients and others around the United States are asking for more dialysis. They want to feel better and “get their lives back.” Allowing them to deliver these prescriptions to themselves with the help of family members and/or possibly other aides, in the home setting, is empowering. However, when requests for reimbursement for these more frequent home modalities are made the response is always, “what is the evidence that more dialysis is better.” Given the history, I would like to turn this question around and instead ask, “What is the evidence that three times per week dialysis for three to four hours is enough?” We can see that this prescription was arrived at largely because of practical issues rather than chosen as the optimal therapy. The challenge for the future will be to reform the reimbursement system for chronic dialysis. A dialysis schedule of long, overnight, thrice weekly or alternate night dialysis may be a reasonable compromise. In addition, patients may have different needs and our challenge is to be creative and flexible, being able to offer dialysis both in the home setting (short daily or at night) as well as in assisted living, retirement communities, rehabilitation centers and conventional in-center dialysis centers (both during the day and overnight). The improvements in technology have been remarkable, allowing flexibility in terms of the prescription and the site of service. We should strive to be the world leader with the best outcomes which will require us to re-engineer our reimbursement policies to benefit from the global cost savings. I would like to close with a quote from Peter F. Drucker, an Austrian born American economist: “The best way to predict the future is to create it.” So let’s proceed and help our people who require dialysis to live. Brenda Kurnik, MD is a private nephrologist, in Marlton, NJ, who recently opened a “state of the art” dialysis center. She serves as a Senior Vice President for Business Development and Government Relations for DSI. Formerly, she served as Associate Chief of Medicine at Robert Wood Johnson Medical Center/Cooper University Hospital, Vice Chair of Medicine at Drexel University College of Medicine and Chief of Nephrology at Hahnemann Hospital in Philadelphia. She was listed as a Philadelphia magazine “Top Doc” in 1994, 1996, 1999 and 2002. 1. Blagg, CR: personal communication. Very much appreciated. 6. Blagg, CR, Home Hemodialysis: “Home, Home, Sweet, Sweet Home” Nephrology 2005, 10, 206-214. 7. Hull, Alan, Home Hemodialysis in this Millennium: the Return of the King? Nephrology News and Issues, Feb 2008, P 41-43.